As you well know, flooding caused by Hurricane Harvey has devastated countless individuals and families living in and around the Texas Gulf Coast. Our customers, employees and management at First Baldwin Insurance know all too well the pain, devastation and challenges our neighbors in Texas face, as Hurricane Ivan and Hurricane Katrina remain fresh on our minds. While the federal government, local governments and many nonprofits are currently working to address basic needs of families that have been displaced, we at First Baldwin Insurance know there is something we can do to help—but we need your help too. Please consider donating to help us achieve our mission of delivering a full trailer-load of essential supplies to those affected by Hurricane Harvey. 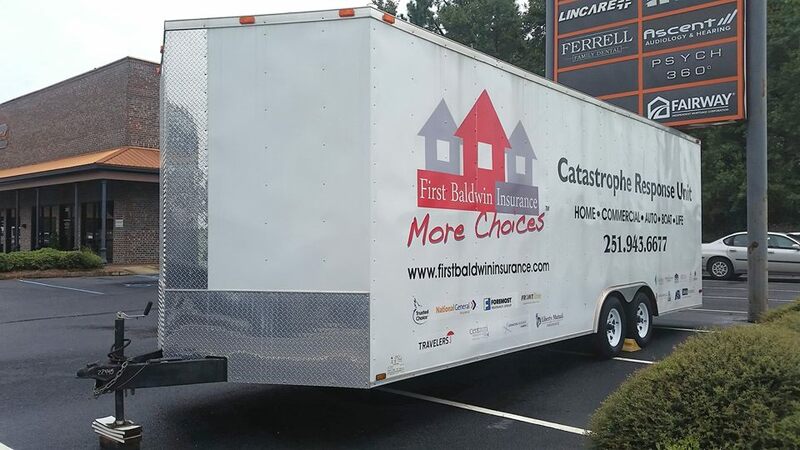 We’ll be working over the next two weeks to fill our 24’ enclosed First Baldwin Insurance catastrophe trailer and deliver it to the Houston area. Your generous donation will be used to purchase much-needed items, such as bottled water, diapers, towels, blankets, toiletries, pillows and individually packaged food. Thank you in advance for helping us stand strong with our Gulf Coast neighbors in Texas. P.S. If you prefer that your donation stay private – this is fine, just mark PRIVATE at the bottom of your check. Otherwise, we’d like to recognize you and your company for your generosity and kindness.